On May 23rd at 1 PM SLT, The Ewing Fashon Agency and Lost World Studios are presenting the 2nd Gallery of Fashion show at the Lost World Gallery. The fashion show will feature some of the latest designs of Elettra Gausamn’s Orage Creations and Mami Jewell’s Azul. These exciting fashions will be show among never before seen photo art works from artists Musique Gable, Aleida Rhode, Barney Roundel, Vitor Algoma, Adonaira Aabye, Joy Fellini, lolmac Shan and Kiya McMahon. Everyone is invited to attend this cultural experience to enjoy the presentation of the clothing and art. Music will be provided by DJ Aris Earnshaw. An after party will follow the fashion show, so plan to stay awhile to dance or just enjoy the art. Fashion and Art are creative outlets for fashion designers and artists alike. So what better place to have a fshion show than at an art gallery among the works of a talented artist. This Thursday, March 12th at 11:30 AM SLT, The Raven-Lynxx Art Works will host The Ewing Fashion Agency’s “Gallery of Fashion” show, the first in its “Fashion in Art” series. The Raven-Lynxx Art Works is a Second Life art gallery run by Ravencloud Nightfire and JohnLynxx Morpork, where they display the works of various SL artists as well as their own. The art displayed consists primarily of RL and SL photographs and sculptures of modern form. This month has the photo art works of Izzy Cole on display. 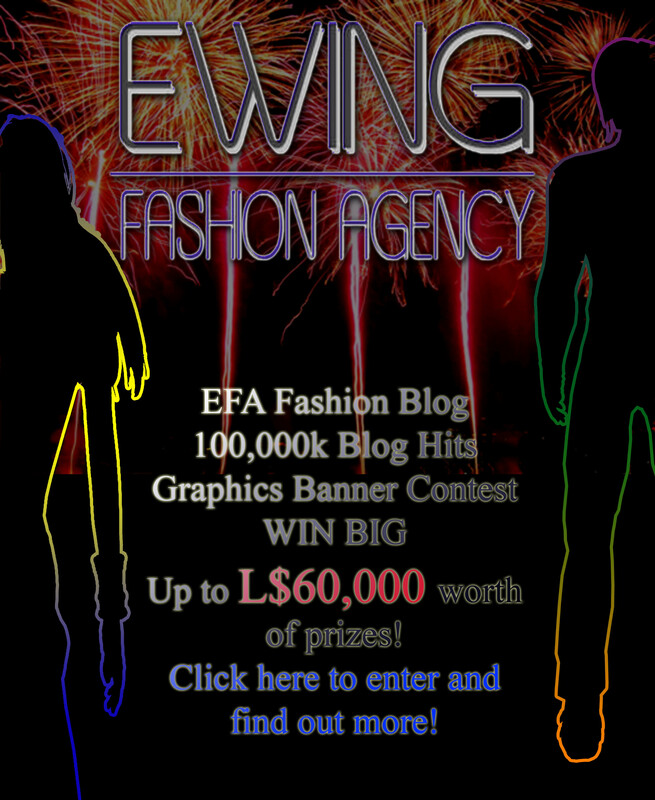 There will ba a fashion show produced by The Ewing Fashion agency on the premises, preceeding anafter party and gallery viewing viewing hosted by Ravencloud and JohnLynxx. Shoe music will be provided by the incomparable DJ Aris Earnshaw. The latest designs from Angel Dessous’ couture and lingerie lines will be presented amongst the art as well as a a surprise preview collection of a totally new brand, L’Abel, from a leading Second Life designer. After the fashion show, Ravencloud and JohnLynxx will host a party and gallery viewing with trance music provided by DJ John. They will also offer a L$1000 prize for for “BEST FASHION OUTFIT”. All are invited to attend in support of Second Life’s creative talent as we bring the worlds of Art and Fashion together. You have just over 24 hours left to create and submit your entries for the EFA Blog Banner contest, and be in with the chance of winning instant exposure across the grid and L$60,000 in prizes! We have had some fantastic entries so far! For full information click here! We are calling to all avatars’ creative and design sides to create a new banner that will be temporarily placed on the blog for all to see. If you have what it takes, then you can’t miss out on the fabulous prizes for this contest.